Photo: Pineapple Supply Co. on Unsplash. While recent triumphs in anti-fur initiatives have raised the spirits of animal lovers around the globe, many are waking up to the ethical and animal welfare issues of the leather industry. Justifiably so: if 100 million animals are killed for fur, over 1 billion - mainly cows and calves but also horses, lambs, goats and pigs, even dogs and cats - are giving their skins up for leather. That’s only the beginning. Much cheap leather is produced is developing countries where animal welfare standards are heart-shatteringly low. Plus, production is a toxic business, with 300kgs of chemicals being added for every 900kg of animal hides tanned. And many of those countries lack legal protections for the people affected by leather production. Pictures of young children wading through the soups of toxins required to turn animal skin into leather are depressingly common. It’s a high price to pay for a £29.99 pair of heels. There are residual problems of perception here. While fur rightly attracts increasing opprobrium, leather is still regarded as integral to fashion life, from the luxury accessory to the payday treat). It’s still hard to look at a leather jacket, a pair of shiny brogues, a watch strap or vintage camera case and think ‘dead cow’ - but that’s what needs to happen for change to occur. Pictures of young children wading through the soups of toxins required to turn animal skin into leather are depressingly common. Picture: Barcroft Media. But, whereas once vegans turned to synthetic options, a parallel realisation is emerging that these materials - often petroleum-based and heavily polluting - come with issues of their own (although at least they don’t involve taking the life of a traumatised animal). The good news is that alternatives have been developed which are animal, planet and person-friendly. More accessible to the ordinary person is the real feast of plant-based options rising up to meet the demand for vegan leather, in which natural materials such as pineapple leaves, paper, wood and cork are turned into viable - and beautiful - textiles. Here, thanks to Lara, are the top contenders for nature-friendly, animal kind options to leather. A vibrant new industry for pineapple growing countries. Picture: Pinatex. The strongest player in plant-based alternatives is pineapple; more specifically, the plant’s leaves, which are strong and flexible. Inspired by piña cloth, an ancestral textile derived from the Red Spanish pineapple leaves, Carmen Hijosa, founder of Ananas Anam, developed Piñatex™, an innovative plant-based textile that offers texture and qualities similar to leather - without the ecological impact. There are additional bonuses to Piñatex™. “Because these are unwanted natural fibres, byproduct of the pineapple harvest, they require no extra land, water, fertilisers or pesticides to produce them,” adds Lara. “And they’ve ended up creating a vibrant new industry for pineapple-growing countries. It is no wonder that their tagline is: Low environmental impact, high social responsibility." Allbirds unveils the Tree line, shoes made from eucalyptus tree fibre. Picture: Allbirds. Earlier this year, cult shoe label Allbirds unveiled the Tree line, a new collection of kicks made of its “most sustainable material to-date:” a eucalyptus tree fibre made from Tencel Lyocell, sourced from South African farms. “Compared to traditional materials like cotton, it uses 95 percent less water and cuts our carbon footprint in half,” Allbirds noted on its website. Eco-friendly, soft, waterproof, biodegradable: cork leather is being used by global brands. Cork is a new but increasingly popular vegan option,. “For designers and consumers, it certainly ticks a lot of boxes,” agrees Lara. 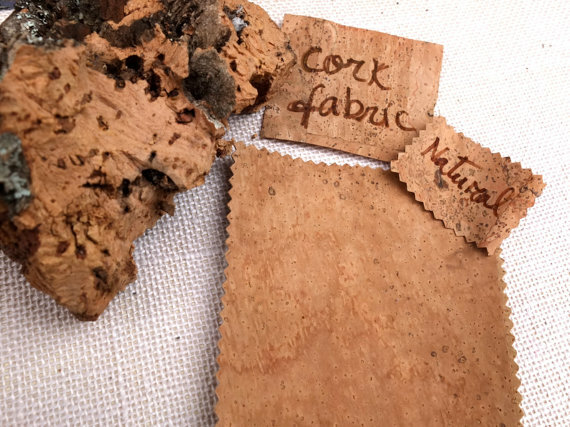 “It’s eco-friendly, soft, easily cleaned, waterproof, and durable - as well as recyclable and biodegradable.” Cork provides a big boost for Portugal, the source of almost all cork, which is transformed in to wallets, bags and shoes. “It’s no surprise to see it being used by global brands such as Vans, Chanel and Louboutin - as well as by specifically sustainable brands including Bourgeois Boheme and Po-Zu,” adds Lara. Kapok is eight times lighter than cotton. Picture: Kapok. The McQueen chair, grown by Phil Ross out of mycelium. Picture: Phil Ross. The humble fungi is stepping into the light as another plant-based alternative to leather. The benefits: mushroom mycelium can be custom grown into virtually any size or texture desired, creating a fabric that is strong, versatile, water-resistant and completely biodegradable. And it’s as soft as suede. “It’s ideal for close-to-skin contact, and each piece is totally unique,” says Lara. One company leading in this field is Bolt Threads; its collaboration with Stella McCartney, an iconic Falabella handbag made milo - a new biomaterial grown from mycelium, an underground root structure - is currently on show at the Victoria & Albert’s seminal exhibition, ‘Fashioned from Nature.’ Another pioneer is Mycoworks, which has created a new kind of leather grown rapidly from mycelium and agricultural byproducts in a carbon-negative process; in 2012, co-founder Resident artist Phil Ross ‘grew’ the Yamanaka collection, a series of striking fungal furniture.